Have you ever been to a new city, place, or environment, and felt like you were the new kid on the block and needed time to take it all in? Here I am, new among the wonderful authors of InspyRomance.com, and yes, I’m looking around, getting my bearings, searching for the pages I’m supposed to update, and stopping every now and then to look at the pretty flowers in this lovely garden. Thank you to the authors for welcoming me to this place on the writerly blogosphere. And to Valerie Comer, who extended the invitation to me. Appreciate it! I would like to say hello to readers who are new to me. I write multiethnic Christian fiction that celebrates the grace of God and hope in Jesus Christ: clean and wholesome contemporary Christian romance with elements of women’s fiction, Christian romantic suspense with an air of mystery, and inspirational international thrillers with threads of sweet Christian romance. For the InspyRomance blog, I will only talk about my contemporary Christian romance books. As mentioned, I’m new here, and in almost the same way, so is Leon Watts, my conflicted hero in ASK YOU LATER (A Savannah Sweethearts Prequel). Leon is a folk art sculptor and artist, who is also experiencing his first day in a new art gallery. Except, his first day ends before it begins! Leon needs to start earning income soon to pay the rent and buy food, and he wants to put his mixed-media artwork in Simon’s Gallery, where tourists and art lovers stream in and out all year round. In fact, Simon’s Gallery signs a contract with him, promising great things—that is, until the gallery owner falls on the sidewalk and breaks his bones, and ends up recuperating at home. The non-artistic daughter of the gallery’s owner, Sophie Kowalski, has taken over the daily operations, for better or for worse. To begin with, she has no appreciation for “messy” art. That is all it takes to get Leon’s artwork removed from the gallery. Yet, in the midst of their cautious interaction, Leon and Sophie find themselves staring—I mean, looking—at each other through new lenses. What could God possibly want them to see? 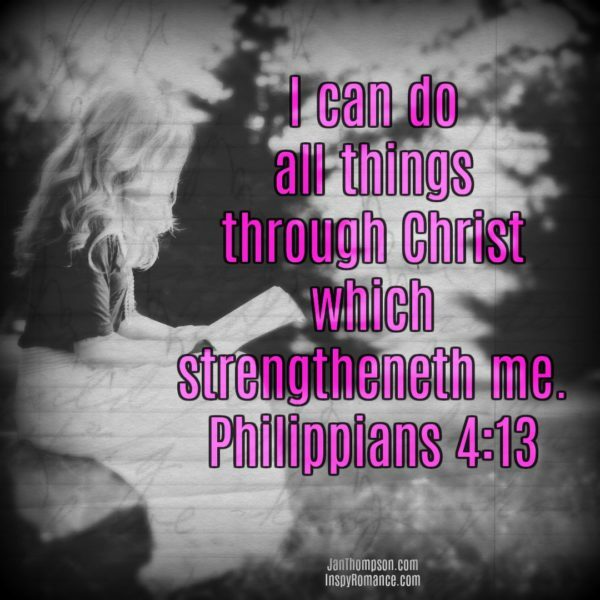 which strengtheneth me” (Philippians 4:13, KJV). As Leon and Sophie navigate through life in the coastal city of Savannah and the beach town of Tybee Island, they have to face the truth of God’s Word and learn to apply it to their lives. 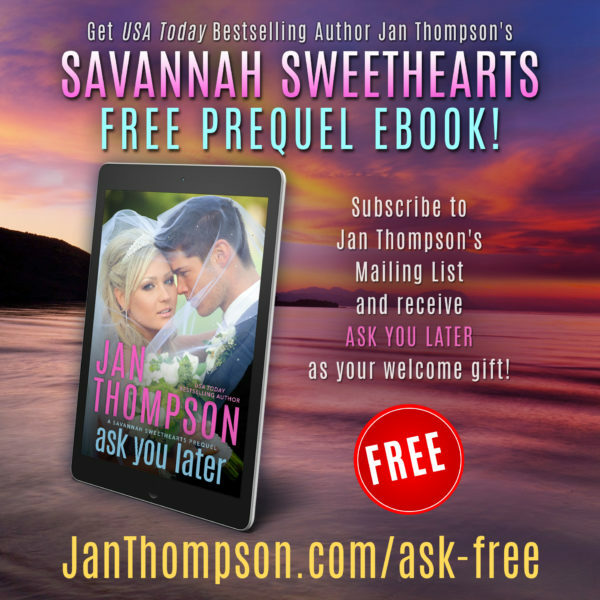 While ASK YOU LATER is listed as a prequel to Savannah Sweethearts, it’s also a prelude to my other contemporary Christian romance collections: Vacation Sweethearts, Protector Sweethearts, and Seaside Chapel. If you’ve already read the novel, would you please write a review? Here are the retailers where you can leave reviews. Thank you so much! Hi Jan! Welcome to Inspy Romance and the delightful introduction. Best wishes in your writing journey. Thank you, Renate, for the welcome! Glad to be here! Hi Jan, welcome to InspyRomance:) Thanks for introducing yourself to us and sharing about Leon and Sophie. It is Autumn here and we are having magic days- warm sunshine, clear skies during the day with cold mornings/evenings. Hi, Jan! Welcome to Inspy!! I have read your Seaside Chapel stories and like them very much! Looking forward to getting to know you better and reading more of your novels! Thank you, Paula! So glad you like Seaside Chapel. Book 3 is coming soon! Hi, welcome to Inspy romance. Have fun getting around and as you say, smelling all the wonderful flowers. Speaking of flowers, it’s spring time in the south these days and I love seeing all the azaleas and daffodils. I do miss my old garden where I had those flowers, plus tulips. And my bird feeders. Love those finches and cardinals coming and going. Now we don’t have a garden because deer do come and eat the flowers, so I can’t plant anything. Hi, Jan. Welcome to the blog! It’s great having you here. Hi Kimberly! Thank you for the welcome! Happy to be here! Hi Jan. I remember reading Ask You Later, perhaps in the Cherish boxset? Welcome to Inspy Romance. I look forward to hearing more from you. Thank you, Sherri. Yes, it was in the CHERISH box set from last year. The box was in Kindle Unlimited, so I was unable to publish the novel on its own until our project was over. That was a fun project! Welcome to the Inspy Romance blog, Jan! So glad you’re joining us! Thank you, Brenda! Glad to be here also! Welcome to Inspy Romance, Jan! Thank you, Valerie! I’m having fun! Thank you, everyone, for the nice comments! Appreciate the welcome. I’m glad to be here. To fellow authors, happy writing! Welcome, Jan! Great to have you here with us. You will love our awesome readers and commenters! Thank you, Autumn! Nice to be here! Welcome Jan. Love your introduction and I look forward to reading more of your blogs. Thank you very much, Colleen! Looks like I have another blog due in May also. Stay tuned! Hi Jan. Glad I’m not the only newbie still trying to get my bearings. LOL Shannon! I hear you! Fortunately we have wonderful author friends here who have been around so much longer on the blog, so we could ask questions and get directions! I just read a novella by Jan from Kill Zone! It sure was exciting, even though I don’t know much about technology, it was very interesting! Makes me want to read your other books! Welcome! Thank you so much, Paula! I’m glad you enjoyed Zero Sum, which is Book 1 of a new series. I enjoyed writing Cayson’s story and I’m glad you mentioned the book. Cayson will make cameo appearances in the next two books. Stay tuned! Thank you, Narelle! Appreciate your welcome! I’m glad to be here too and looking forward to the rest of the year!